With most technologies still being developed and honed and yet to go mainstream big time, the global robotic rehabilitation and assistive technologies market is still in a nascent state. It is said that only a small proportion of various applications are being explored in universities, laboratories, and start-up companies. Currently, a fast expanding elderly population and rising instances of stroke rendering people immobile are driving sales in the market. Crimping sales, on the other hand, is the expensiveness of the robotic rehabilitation and assistive technologies. However, development of more viable manufacturing methods will help to overcome the pricing challenge in the near future, industry experts point out. The global robotic rehabilitation and assistive technologies market, which is fragmented on account of the presence of a copious number of startups and smaller companies, is projected to attain a value of US$ 2,290.3 mn by 2025 from US$ 765.1 mn in 2016 by rising at a CAGR of 13.1% from 2017 to 2025, as per a study by Transparency Market Research. Robotic rehabilitation and assistive technologies can be divided into standalone and mobile, based on their portability. Standalone robots are fixed at one place and perform a single task or a set of fixed task. They are not meant for multitasking and their operations are limited. However, they still gross maximum revenue in the market. In the next couple of years as well, the segment will retain its dominant share in revenue on the back of helpful reimbursement policies and its efficiency in inpatient rehabilitation. In addition, technological advancement is a key factor which is anticipated to drive the segment’s growth during the forecast period. Depending upon type, again, the two broad segments of the market are assistive robot and rehabilitation robot. Of the two, the assistive robot, which is a medical device that performs action to benefit people with disabilities and help the elderly carry out their day-to-day work, accounts for maximum revenue share. In the years ahead too, the segment is expected to retain its dominant share. From a geographical perspective, the global robotic rehabilitation and assistive technologies market is dominated North America. This is because of a well-established robotic industry, quick uptake of newer robotic rehabilitation and assistive technologies. In the years ahead too, North America will continue holding its leading position by expanding at a CAGR of 12.8%. The market is projected to become worth US$1.07 bn by 2025. Europe trails North America in terms of market share. The market in the region, powered primarily by Germany, is being driven by the early adoption of newer robotic rehabilitation and assistive technologies. In terms of growth rate, on the other hand, Asia Pacific is expected to outshine all other regions. The market in the region is anticipated to clock a solid 15.3% CAGR from 2017 to 2025 to become worth US$474.1 mn by 2025. 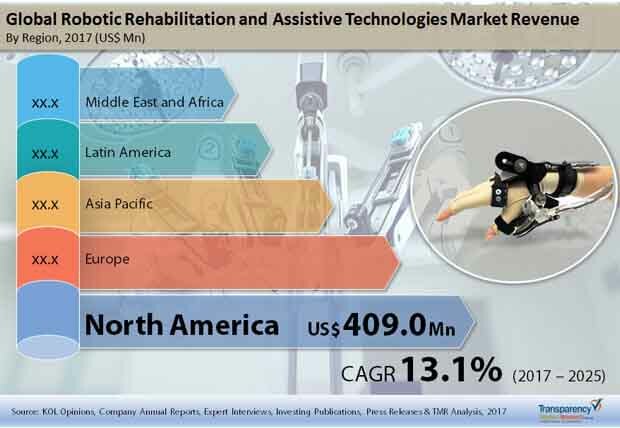 The growth of robotic rehabilitation and assistive technologies market is Asia Pacific is attributed to aging population as one of the prime factors that is driving the demand for robotic rehabilitation and assistive technologies. A few of the pioneering companies in the global robotic rehabilitation and assistive technologies market are Accuray Incorporated, AlterG, Inc., Bionik Laboratories Corp., DIH Technologies Corporation, Ekso Bionics, Intuitive Surgical, Inc, Instead Technology Ltd., Mazor Robotics, Reha-Stim Medtec GmbH & Co. KG, and Vincent Medical. The robotic rehabilitation and assistive technologies market accounts for rehabilitation robots and assistive technology robots. A robot is a mechanical and virtual intelligent agent that is guided by a computer program. An assistive robot is a medical device that performs action to benefit people with disabilities and geriatric population in their daily living. A rehabilitation therapy robot requires two users at a time – a person with disability who receives the therapy and a therapist who sets and monitors the interaction of the robot. The therapy received by the patient during rehabilitation includes upper and lower extremity movement therapy, cerebral palsy therapy for children, and therapy for children with autism and other developmental disabilities. Standalone robots include those robots that are fixed in one place and perform a single task or a set of fixed task. A mobile robot is one that is specifically designed to provide diagnostics or therapeutic benefits to disabled people. It is portable in nature and multitasking. The cognitive aid and motor skill therapy are provided to people who have dementia, autism, or other disorders that affect communication and physical well-being. Robotic rehabilitation therapy and assistive technologies are dramatically transforming the landscape of the health care industry and lifestyle of patients and disabled persons. Manufacturers are stepping up the development of health care rehabilitation robots because the global market for such equipment is expected to grow rapidly. The rapid growth of the robotic rehabilitation and assistive technologies is driven by a blend of technological improvements such as use of more efficient motors, compact and light materials, power back-up and sophisticated controls and safety mechanisms. Global robotic rehabilitation and assistive technologies market has been broadly segmented into four segments: by type, by portability, by application and by geography. By type, market is segmented into Assistive Robot and Rehabilitation Robot. The Assistive Robot segment is projected to account largest market share by the end of 2025. Rising prevalence of disability disorders such as dementia and autism in which patients need assistance in communication and physical well-being. Robotic rehabilitation and assistive technologies market by portability has been segmented into standalone and mobile. Standalone is projected to account largest market share by the end of 2025. Mobile segment is projected to grow at highest CAGR during forecast period. Robotic rehabilitation and assistive technologies market by application has been segmented into surgery, cognitive and motor skill therapy and others. By application surgery dominated the global robotic rehabilitation and assistive technologies market and is likely to maintain its position by the end of 2025. Geographically, the global robotic rehabilitation and assistive technologies market is segmented into five regions: North America, Europe, Asia Pacific, Latin America and Middle East & Africa. These regions have been further segmented by countries, type, portability and applications. North America dominated the market and is anticipated to lose its market share to Asia Pacific region by the end of 2025. The competition matrix section included in the report is likely to assist the existing players to increase their market shares and new companies to establish their presence in the global robotic rehabilitation and assistive technologies market. The report also profiles major players in the market based on various attributes such as company overview, financial overview, SWOT analysis, key business strategies, product portfolio, and recent developments. Major companies competing in the global robotic rehabilitation and assistive technologies market, and profiled in the report include Accuray Incorporated, AlterG, Inc., Bionik Laboratories Corp., DIH Technologies Corporation, Ekso Bionics, Intuitive Surgical, Inc, Instead Technology Ltd., Mazor Robotics, Reha-Stim Medtec GmbH & Co. KG and Vincent Medical.